Open chords (as distinct from open-string chords) are chords that have more open strings then fretted strings. They sound beautiful and they’re easy to play. Their drawback (and their strength) is that they exist in a sound-world of their own. Using them in progressions with standard open-string chords can be tricky. But doing the work to explore the possibilities can be a lot of fun. 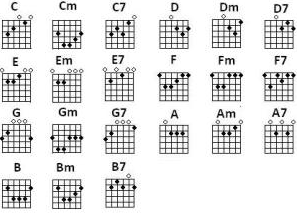 Open chord shapes are simple shapes that you move around on the fretboard to create different chords. For example, take a 2-finger shape and play it at the 3rd fret. Now move that shape to another fret and play it there. Here’s a simple power chord shape. Normally, this shape is used on the 6th and 5th strings or on the 5th and 4th strings. Open strings are rarely used. Here, they’re a necessary part of the chord. This chord has the power chord shape on the 4th and 3rd strings at the 3rd fret. Try strumming across all six strings, or across strings 5 to 1. Move the entire shape to different places on the fretboard. You’ll find other sounds you like, and it’ll be easy. Try going from the Dmajor open string chord to the open chord above. Now do the same thing with a Dmajsus4 chord (just play the Dmajor, but lift the finger on the high E string). Which do you like better? A lot of people like the Dmajsus4, because it has more open strings than the Dmajor. That helps it move more smoothly to the open chord. Depending on what you’re writing, you may not want that smoothness. As always, there’s a lot of experimenting to do. Play the Dmajor or the Dmajsus4, and then move to open chords at different locations on the neck. Place an open chord between two open string chords, or vice-versa. Take a progression you know and randomly stick open chords between adjacent chords of that progression. You might get something you like. You might not. Now move the shape to the 2nd and 3rd strings and try that at different locations on the fretboard.